I am so close to finishing this. Which is excellent, because I very much want to block it and send it to live in LA. I’m neglecting my reading, and I even allowed myself to watch the entire final disc of Mad Men Season 3 on Saturday. 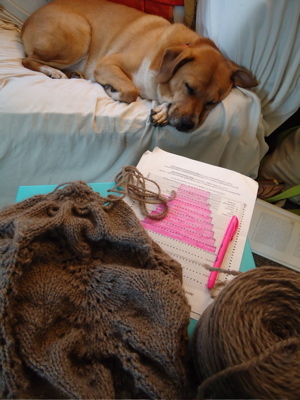 (Okay, and I’m currently downloading the first few episodes of Season 4 to keep me company as I knit around and around.) 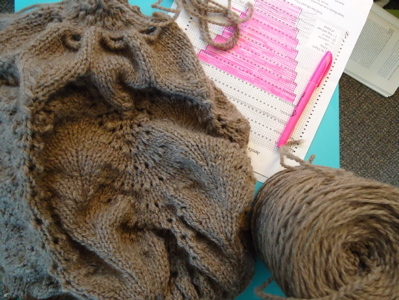 I have a few rows of stockinette and one more increase section before I bind off. And then I’ll be able to keep reading…and perhaps cast on a few of the projects I’ve been daydreaming about lately!